If there's one word to describe Mira Darkstorm it's: devoted. Hmm, two words actually. She's incredibly clumsy too. Let's start over, there are two words that make up the whole of Mira and it's devoted clumsiness. Wait, that's not quite right either. Silliness aside, she's a woman hopelessly in love. I won't go into details about her weight, height, as I'd like to leave that for an omnibus(with artwork!) 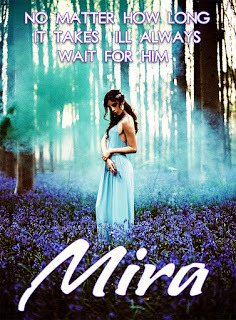 but Mira is mirrored after the countless women that faithfully wait for their husbands to return home from a long journey. And she's been waiting for Skoll Darkstorm to return for a very, very, long time. Well, when you happen to fall in love with the Big, Bad, Wolf what else is there to expect? Nothing but heartbreak. Nothing but sorrow mixed in with a sprinkle or two of happiness. Yet Mira will take those heavy doses of sadness for a mere taste of bliss again. I often portray Mira as a clumsy woman that can't help but look to the bright-side of situations on matter the consequences. She's tragic in that way. Always seeking the good, even in the worst. Does she deserve to be tortured, I often wonder to myself. Of course, a happy ending is never given freely. See how Mira's side story plays out in Chronicles of Zaloria - Windstorm. The sequel to the Feral Hearts novel that debuts this November 2018!